It's still unclear what lawmakers will do to address $7 trillion in looming tax increases and spending cuts. If they do nothing by Dec. 31, here's what will happen. NEW YORK (CNNMoney) -- If lawmakers cannot agree on how to address the pending "fiscal cliff," $7 trillion worth of tax increases and spending cuts will begin to go into effect in January. The smart money says Congress won't come close to an agreement before the November election, and that lawmakers may not even be able to reach one until early next year. At that point, of course, they'd need to undo at least some of the tax increases and spending cuts that went into effect. 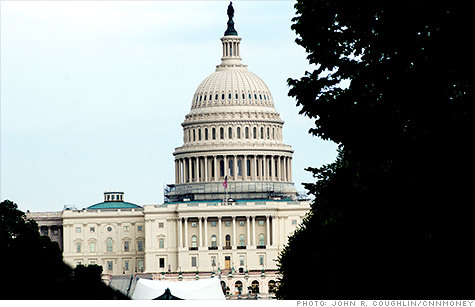 In the meantime, uncertainty about just what Congress will do will weigh on the economy. Here's a rundown of what happens if lawmakers fail to act before Jan. 1, 2013. Since Congress has failed to reach a bipartisan debt-reduction deal, the Budget Control Act requires automatic spending cuts to commence on Jan. 2 that will amount to $1.2 trillion in deficit reduction over 10 years. Defense: $55 billion will be cut in 2013 from projected levels of discretionary defense spending. That translates into at least a 10% cut to every program, project and activity that's not explicitly exempt. Nondefense: $55 billion will be cut from projected levels of nondefense spending, which includes things like education, food inspections and air travel safety. Budget experts estimate the cuts will result in at least an 8% cut to programs, projects and activities. Qualified dividend rate: Rises to one's top income tax rate, up from 15% for most filers. Estate tax:Parameters revert to pre-2001 levels. The exemption level falls to $1 million from $5 million; and the top tax rate on taxable estates rises to 55%, up from 35%. Won't be renewed. Income exempt from the Alternative Minimum Tax in 2012 -- for which taxpayers will file returns next year -- falls to $33,750 for individuals and $45,000 for married couples. That's down from $50,600 and $78,750, respectively, if the exemption amounts had been adjusted for inflation. A bipartisan bill from the Senate Finance Committee proposes a patch for 2012 and 2013 but it has not passed the Senate or House yet. Expires. The Social Security tax rate reverts to 6.2%, up from 4.2%, on the first $110,100 in wages. Effectively, someone making $50,000 will pay another $1,000 in payroll taxes next year. The federal extension expires. That means workers who lose their jobs after July 1, 2012, will only receive up to 26 weeks in state unemployment benefits, down from as many as 99 weeks in state and federal benefits that had been available until recently. A host of smaller individual and business tax breaks will have expired. A bipartisan bill from the Senate Finance Committee proposes to extend many of them, but it has not passed the Senate or House yet. Expires. Medicare payment rates for physician services drops by 27%. Some budget experts count as part of the fiscal cliff the onset of a new Medicare surtax on high-income households under health reform. But unlike the other fiscal cliff tax provisions, the new tax was not written into law as a wink-wink "temporary" provision. It is, however, included to reflect the magnitude of tax increases set to take effect simultaneously in 2013. A 0.9% surtax will apply to wages on earned income over $200,000 ($250,000 if married). That's on top of the 1.45% Medicare currently owed on all wages. Those making between $200,000 and $500,000, for instance, will only pay about $633 extra while households making $1 million or more would pay another $11,242. A 3.8% Medicare surtax will also apply for the first time to at least a portion of high-income households' investment income.